Rabat---The US embassy in Rabat organized on Saturday a solidarity day with orphans on the occasion of Eid al-Adha, celebrated in Morocco last Wednesday. A total of 700 orphans, from different cities of Morocco (Rabat, Salé, Temara, and Meknes), gathered in Palais Tazi in Rabat for a day of solidarity and sharing organized by the US embassy in cooperation with other embassies including Iraq, Saudi Arabia, and Tunisia. “We have already organized a similar event with 60 orphans during the performance of the New Orleans band in Morocco, and we were touched to see two sisters recognize their two brothers who are residing in another orphanage. So we thought it would be great to organize this day and make them feel happy, and serve them food and beverage by ourselves without any protocol,” Riley added. “We are trying our best to make these deprived children live as if they were in a family,” he added. Figures from the world of arts and cinema attended the event. 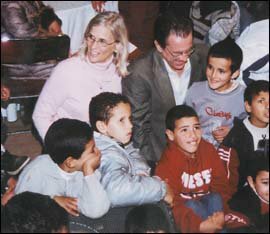 Naima Lamcharki, Aziz Maouhoub, Rachid al-Wali, Abdelkabir Ragagna, Naima Ilyas, Haj Youness, Mohammed Khiyari, among others, all came to share with the children their happiness. A number of activities were scheduled during the day for the children. These included animation, music and entertainment, dancing and clowns. This event is the third of its kind that Palais Tazi hosts for the benefit of orphans. The owners of the palace are intending to invest in the health field through the creation of a foundation called “Attasahol Foundation” to manage activities related to orphans and children's health. The owners of the palace will also offer a piece of land to the “Operation Smile to allow them build a healthcare centre for children in Casablanca.